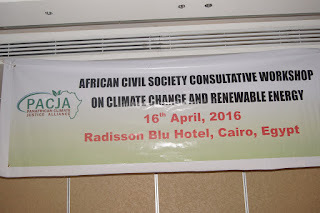 CAIRO, Egypt (PAMACC News) - African Civil Society Organisations have called for the need to decentralize renewable energy and make it people centered. The CSOs echoed their voices today at the sidelines of the sixth special session of the African Ministerial Conference on the Environment (AMCEN) holding in Cairo, Egypt. In his remarks during the presentations on Post-Paris conversations on climate change, renewable energy, energy transformation and access in Africa, Mithika Mwenda who represents millions of African farmers, women and youth groups under the umbrella of the Pan African Climate Justice Alliance urged African governments to work towards ensuring that energy is decentralized and not concentrated on urban areas only. Reinforcing the same line of thinking, Augustine Njamnshi from Cameroon stated that “there is need to invest in decentralized production and use of renewable energy and to make it community-driven if we are serious about transforming people’s lives with energy,”. Civil society actors from across Africa also stressed the need to correct the erroneous impression that energy only means lighting up people’s homes. It is for this reason that the CSOs agreed that there is need for AREI and indeed other renewable energy initiatives on the continent to look at energy in a much broader context. Hindou Oumarou Ibrahim, representing Mbororo pastoralists in Chad and co-chair of the International Indigenous Peoples Forum on Climate Change, said there is need to look at energy as veritable means to food security, job creation, poverty reduction among other several key social-economic developments that come with availability and accessibility to energy. “The most urgent need for someone in rural area is food, lighting up the home only comes as a secondary need. We therefore need to take into account how energy can bring food to Africans and that is energy for agricultural production. Energy is more than just lighting up homes,” she said. Dr Ahmed Hegazi, head of Water Engineering and Renewable Energy Unit at the Nuclear Research Center in Egypt added that energy is a catalyst for development without which there can never be development. 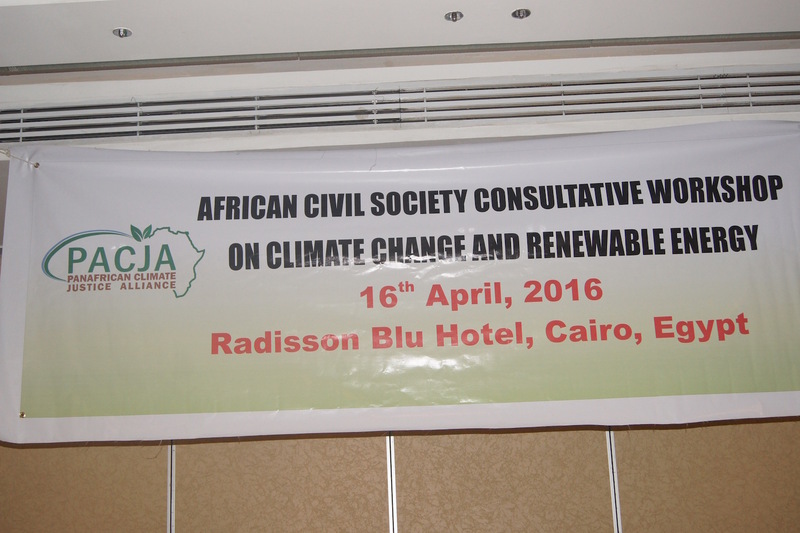 The CSOs’ meeting resolutions will be shared with the African Ministerial Conference of Environment (AMCEN) which opened today and is expected to end on 19th April 2016. The nagging issue at both the CSOs’ meeting and AMCEN is the issue of renewable energy and how it can transform people’s lives in a continent that is reeling under perennial energy gap. Statistics from the African Development Bank (AfDB) show that over 640 million Africans have no access to electricity. Africa is known for its darkness, not for its light. Also, over 700 million Africans have no access to clean cooking energy. The bank further reveals that Africa loses 600,000 people every year through indoor pollution as a result of relying on charcoal, kerosene and fuel wood. Dr. Khaled Fahmy, Minister of Environment of Egypt and President of AMCEN believes that “It is of paramount importance that this AMCEN session addresses the way forward for swift implementation of the African Renewable Energy Initiative as well as the African Adaptation Initiative.